If Hamilton made automobiles, the Boulton would be the Volkswagen Beetle. Introduced in 1940, the Boulton was produced through 1952. It was reintroduced again in 1954 for one year. Then, in 1960, it was reintroduced again as the Boulton II and produced through 1969. In addition, it was reintroduced a fourth time as a quartz version in today's modern Hamilton line up. 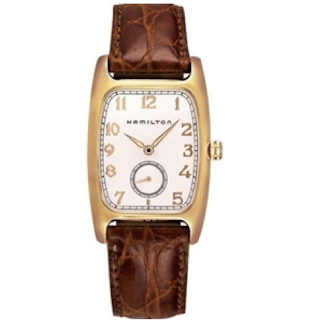 The vintage model always featured a high-end movement. Originally it was the 14/0 sized, 19 Jewel 982 movement. I suspect the 1954 model is the "Boulton B", although the catalogs don't call it that. The B model featured a 12/0 sized, 19J 753 movement. 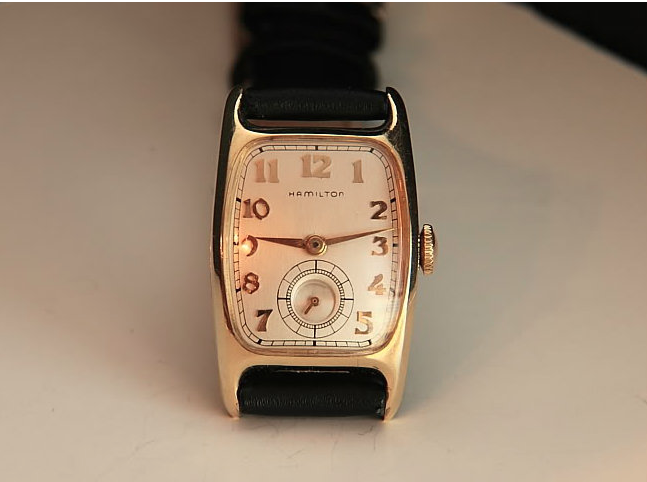 Finally, the Boulton II utilized the 22 jewel, 12/0 sized 770 movement - regarded as the best Hamilton ever made. The only way to tell a Boulton and a Boulton B apart is to look at the movement. The inside of the cases are different to accommodate the different sized movements but the dials, hands, etc. are otherwise identical. Boulton's typically wear extensively to the bottom of the lugs on the reverse. The key to finding a nice Boulton is to look at the back of the case... if the lugs are in good shape then everything else can be restored to "like new" condition. If the case is well worn, then the restorability is less. Here's a close up of a 1940's Boulton. The Boulton II features a refined dial, in addition to the 22 jewel 770 movement. Here's a side-by-side comparison of all three. The modern version is very similarly styled to the original but it's much larger. In addition, a white, stainless steel version is also available. Most watch enthusiasts turn up their noses at quart watches so the modern version's appeal is limited. The Boulton is surprisingly popular. Although it was made for many years and is easily found, it can still command a premium when it is in good shape. Like the Volkswagen Beetle, it has evolved with time but stayed true to it's original aesthetics and is easily recognizable. Classic design in my opinion. A man can never have enough Boultons - so I'm told! You would know... you're off to a great start! One for each arm and maybe even an ankle. 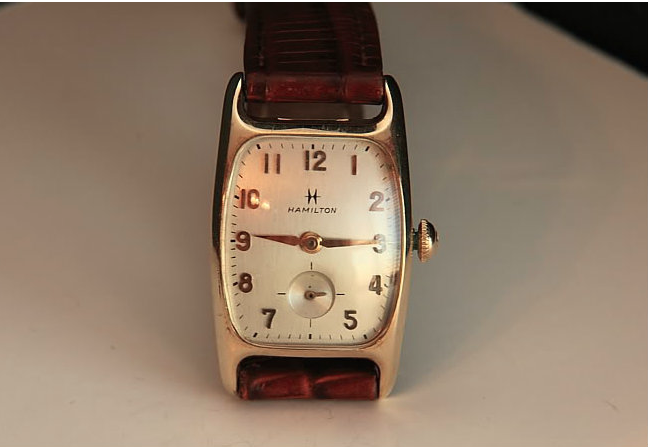 Great site I really like the old Hamilton watches. Growing up I remember the one my dad had, I beleive it is the Boulton. He received it as a high school graduation gift. Funny the little things that you remember as a kid, but I really remember that watch. He lost it so it never got passed down. I am going to keep my eye on our Etsy site and if one comes up I may be interested. Thanks for doing what you do. 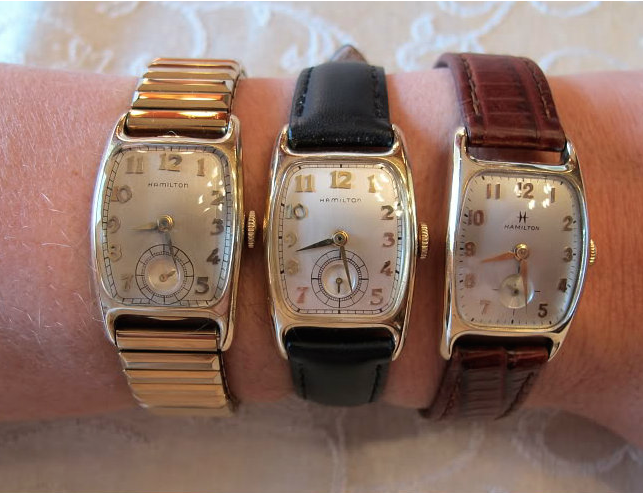 Boultons are super easy to find... probably the most common watch there is since they were made from 1940 through 1969 with a few Boulton-free years in the 1950's. The trick is to get one without wear to the back of the lugs. I've restored quite a few Boultons - so many that my interest in buying another is pretty low to be honest. 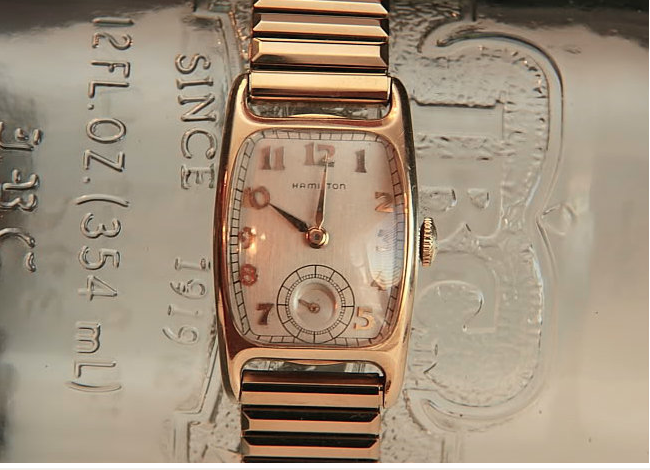 But you can buy a nice one on ebay and send it to a watchmaker for an overhaul and be all set. Hello Dan, I was able to pick one up on eBay, that is going to need a little work. Can you recommend a watchmaker that is good and would beable to do some work on it. Dan, I have an original 1940-s Boulton missing a second hand and a crown, otherwise in pretty decent shape. Do you have the part numbers by any chance to make my search a bit more accurate? Where do you look for stuff like that? There are a couple of parts manuals available on line. Some you can purchase (like the BestFit system) or you download the Marshall Handy Manual (http://www.phfactor.net/wtf/Marshall%20Handy%20Manual/Marshall%201.pdf). There are also original Hamilton Parts catalogs out there if you do a little Googling. The trick is then to identify the most likely part numbers based on the specification and then call around to parts houses. You have to go by movement grade, not watch model. So a 1940's Boulton would be a 982. As for the most likely path to obtaining a part... that would be a parts movement on eBay where what you see is what you get. The crown would need to be "Tap 8" so any 14/0 (980/982) or 6/0 (987-based) movement would work - you just need the right style. The second hand would come from any 14/0 or 12/0 (752, 753, 754 or 770) movement with the right style hand. I found a very clean beautiful dial yesterday. I have the movement all serviced a NOS Boulton ll case, crystal and hamilton NOS crown & stem. Also a brand new dark brown NOS strap & buckle. I have the 1952 Boulton that my mother gave my Father in August 1952 and I am wearing it today in his honor. I never remember not seeing my Dad wearing that watch--he swore by it. 64 years later--I wear it with a vintage Kreisler band that has a deployment clasp that I put on it to fit my larger wrist. when I had it serviced in 2012--the watchmaker stated it looked like brand new inside. 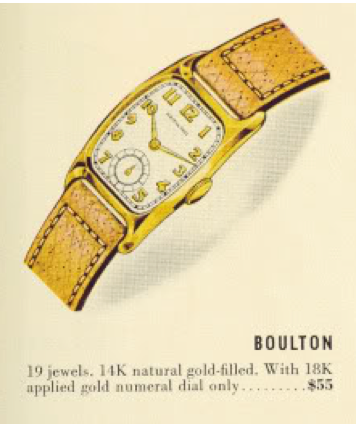 Did the Boulton model have a black dial as an option in the 1940s? I'm looking to purchase and want "all original". Thanks for any help! Nope. If you see a black dialed Boulton it's either not a Boulton or it's a custom refinish. Other similar models, like the Medford, did have a black dial. I'm the proud owner of my grandfathers Boulton, c1941 I believe, with the 982 movement which I've had serviced by my local watchmaker and considering having some work done to its face. For the most part, all looks good, tho the face is 'speckled' and the second hand insert needs (or could use) reworking. Wondering if I should do this..or leave it as is, to keep with its originality...?!?! Some say better not to restore vintage pieces..
Boultons are very common, you could find another with a better dial and just swap it out. I remember my dad’s Bolton by Hamilton. It was gold with the fancy metal band. It had a large face. I liked the man’s watch over the size for women. I want to find one and have been searching for 5 years but I guess in all the wrong places. You must not have looked on eBay. It’s a very common model.